Medical Advancements occur everyday and create many new therapies for wound care that offer both pain relieve and more rapid healing. According to the Journal of the American Medical Association compression therapy is one of the most common tools used to help patients suffering from ulcerations of the leg. Additionally, it has significant benefits for patients with conditions such as lymphedema. motorized compression sleeves with a pump system can also be administered in more severe cases (most commonly in a hospital setting). Compression therapy helps to reduce the buildup of fluid under the skin to help bring down swelling and increase blood flow. The pressure allows the veins to expand which assists the wounded area in maintaining a steady blood flow. This aids in speeding up the healing process while preventing infection. And, because compression therapy plays a significant role in the reduction of swelling (which can limit the skin’s oxygenation abilities), wounds can heal weeks or even months quicker than without the therapy. Additionally, if compression continues after the area is healed, it has been shown to reduce the risk of the reoccurrence of ulcerations. Rapid healing is one of the key benefits of this therapy, but it also helps to minimize the pain and discomfort that is associated with swelling. This leads to better sleep and increased mobility. 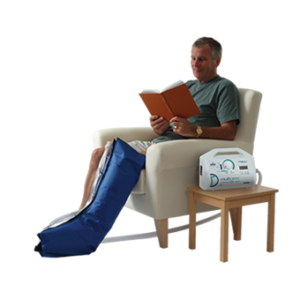 Compression therapy is ideal for individuals who sit for extended periods of time or lead a moderately sedentary lifestyle. It also is good for people who suffer from varicose veins or post–thrombotic syndrome. Conversely, individuals who have the following conditions, should not use compression therapy unless recommended by a doctor. At Westside Medical Supply we offer customers a wide range of compression therapy products to help with wound care as well as other conditions that cause edema. Contact us today to discuss your needs. We can help you determine what therapies your insurance carrier will cover. As with all medical conditions, it is important to see the advice of your doctor before any type of therapy or treatment.